Scribe Online is a simple yet robust iPaaS Cloud for services such as replication, migration and integration from cloud-based and on-premise apps. 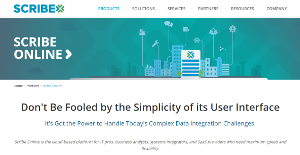 Built for systems integrators, SaaS providers, IT professionals, and business analysts, this tool offers a graphical, code-free interface and pre-built connectors to accelerate your integration projects. It aims to take hassle out of the integration process and provides developers and business analysts with the agility they need. Dozens of built-in connectors for different technologies and applications help accelerate integration projects, while the cloud-based service makes the whole process simpler, easier and quicker. It allows businesses to create real-time integrations such as CRM to ERP or marketing and helps in seamless migration of data between business applications and from one system to another. Scribe Online minimizes the number of tools you need to implement complex processes and gives you a single tool for all your integration efforts. It is equipped with a self-documenting interface, management console and collaboration features all designed to streamline the processes involved for your integrations throughout its entire lifecycle. Scribe Online is an all-in-one platform able to satisfy all cloud integration needs ranging from loading text files to data sync across multiple apps. The replication services allow businesses to easily copy their cloud-based data to a premise-based DB for analysis, while migration services help load, extract and transform data from one application to another more efficiently. The software helps businesses reduce the cost and time of creating integrations and saves them from custom coding to multiple-APIs. Scribe offers Scribe Insight for businesses looking for an on premise integration platform that ensures peace of mind. Scribe Insight helps businesses connect their front and back office business applications with ready-to-use business connectors. Like the online solution, the on premise solution also features a graphical user interface and does not require coding experience. It also offers a template library for designing custom integrations. Every company is different, and may need a special IT Management Software solution that will be fit for their business size, type of clients and staff and even individual industry they cater to. It's not wise to count on finding an ideal app that will work for every business no matter what their history is. It may be a good idea to read a few Scribe Online reviews first and even then you should remember what the software is intended to do for your company and your staff. Do you need a simple and straightforward app with just essential functions? Will you really use the complex tools needed by experts and big enterprises? Are there any particular features that are especially practical for the industry you work in? If you ask yourself these questions it will be much easier to get a reliable service that will fit your budget. How Much Does Scribe Online Cost? We realize that when you make a decision to buy IT Management Software it’s important not only to see how experts evaluate it in their reviews, but also to find out if the real people and companies that buy it are actually satisfied with the product. That’s why we’ve created our behavior-based Customer Satisfaction Algorithm™ that gathers customer reviews, comments and Scribe Online reviews across a wide range of social media sites. The data is then presented in an easy to digest form showing how many people had positive and negative experience with Scribe Online. With that information at hand you should be equipped to make an informed buying decision that you won’t regret. What are Scribe Online pricing details? What integrations are available for Scribe Online? If you need more information about Scribe Online or you simply have a question let us know what you need and we’ll forward your request directly to the vendor.